KONICA MINOLTA DIGITAL CAMERA When this 1936 Ford Deluxe Coupe (three windows, as the sales brochure tells us) went on sale, you could have any engine you wanted as long as it was a 221 cu. in. V-8. No sixes this year. 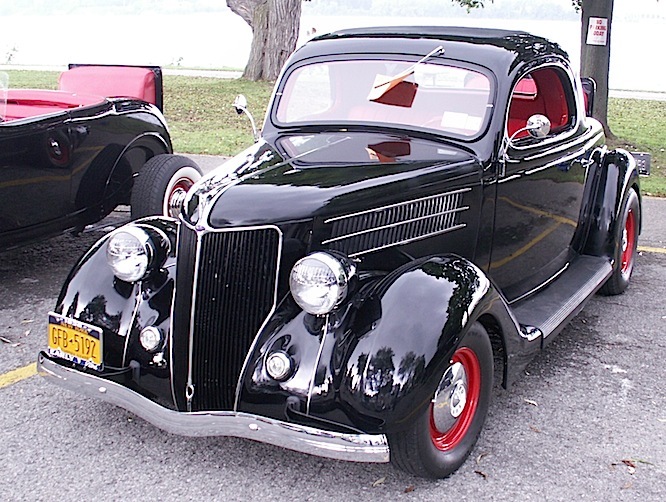 The rumble seat was an optional extra (also available in the five-window coupe), but was standard on the Deluxe Roadster and Convertible Cabriolet models. I guess Ford figured that anyone who liked to put their tops down also like to put passengers in the trunk! Saw this example a couple of summers ago at the Labor Day car show in Tonawanda’s Niawanda Park. — Jim Corbran, RRofWNY The post RealRides Of WNY appeared first on Buffalo Cars.